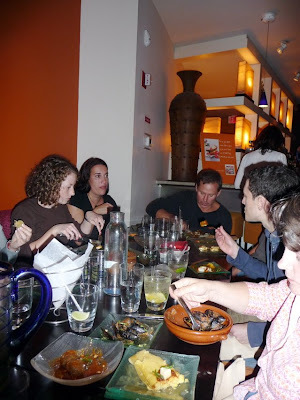 we decided to go to dinner as a group on thursday night, and picked oyamel. it is an outpost of chef jose andres, who is a big deal spanish chef. but this joint is mexican. specifically, oaxacan (wah-ha-can). more specifically, oaxacan tapas. turns out, i really like saying "oaxacan tapas." there were 10 of us, and i was sitting at one end of the table and can really only speak for what was going on at our end of the table, tho i didn't hear anyone saying there was a problem. everything was pretty good. 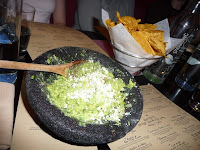 we started with a couple of orders of guacamole, which is made tableside with no small degree of fanfare. there were trays of ingredients, and big avacadoes, and a molcajete on each tray. prior to this, the best guacamole i have had was the gratis guac brought to the table at topolobampo in chicago a few years ago. i can't really compare this to that, du to the passage of time, but this was the best i've had since then. you would've thought for all the world that there was cream in there somehow, as luscious as it was. the house-made tortilla chips were pretty spectacular, too. we ordered a few tapas. 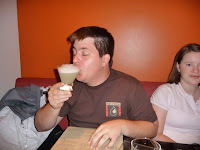 first were the mejillonesal tequila con chipotle. 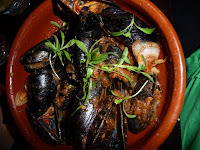 steamed mussels. i've been on a steamed mussels kick lately. these were really good, and pretty unlike any mussels i've had before. usually steamed in a white wine-pernod-butter sauce, these were steamed in a sauce of tequila and chipotle. they were really good mussels, and the sauce was very unique. we also had the ensalada de palmitos. hearts of palm salad. 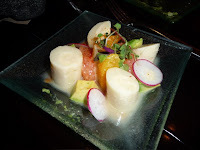 it had about five big chunks of hearts of palm, with orange, radish and avacado. and a tamarind dressing that was tart, but not too. the third tapa we had takes a little explaining. several years ago, i watched a cooking demo by a mexican chef at epcot. she was from the state of michoacan and she made a regional dish called uchepos. 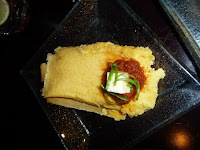 they were basically a less-dense version of tamales. as we were driving up to DC, i told that story -- with some additional details that are irrelevant here, and i believe may have been covered in a previous post about coyote cafe in santa fe -- to becky. fast forward to thursday, and one of the specials at oyamel was uchepos de michoacan. so i got them. it was good, but i'd rather have a tamal. it was tasy, but the heaviness of the corn meal seemed to be lightened up almost souffle-like. i plan on looking to see if i still have the epcot recipe to see if that is how they do it. good, but not unreal. then we had the albondigas. 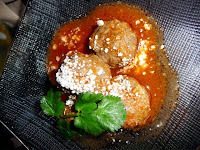 meatballs in a chile sauce. and next to oaxacan tapas, one of my favorite things to say. some of the other things we tried from around the table included the papas al mole. mole is the distinctive mexican sauce of chilies, and often softened with a touch of chocolate, and oaxaca is gound zero for mole. it was basically over french fries. this is a good idea. also tried the ceviche de atua pacifico. that's a tuna ceviche. i'd never had tuna ceviche before, and it reminded me more of a tartare. it was a plate of raw chunks of tuna marinated in maggi lime with scallions, avocado, jalapeno and toasted pecans for some crunch. it was about this time that i got a text message telling me i had won the aces headline contest again. so if i wasn't already plenty happy, that did it for me. after i went outside to get the details on all that, i came back in and had a couple of tacos. they were the right kind of tacos -- soft corn tortillas and minimal fillings. 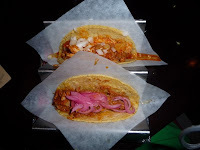 i tried the tinga poblana, which was shredded chicken, with potatoes, chorizo and chpiotle, and the cochinita pibil con cebolla en escabeche, which was a pit bbq pork with pickled red onions and sour orange. both were fine, neither was great. they didn't seem particularly special, where almost everything else did. what i didn't have: the most expensive taco on the menu is made with grasshopper. other people were planning to have it and i was afraid i would lose all my culinary cred if i didn't try it. so i was prepared to. but they didn't have any. they said they were out of season, but they didn't say when grasshopper season was. they also implied that no one actually liked them, and that people basically ordered them on a dare. so, since i was willing to eat one, i am counting it. for dessert i had the cafe de olla. 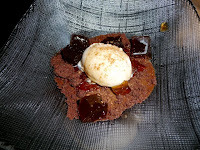 it was a place of chocolate-coffee custard -- almost caramel-like -- topped with little cubes of kahlua gelatin, a brown sugar syrup and a scoop of star anise ice cream that was pretty intense. it was a strange combination of flavors and textures, but it all worked out. overall, a ton of fun and good food. i'd go back.